We have daily departures from Caguita and Puerto Viejo. Double Occupancy: $189 per person – Tortuguero Economy Hotel. La Casona Lodge. 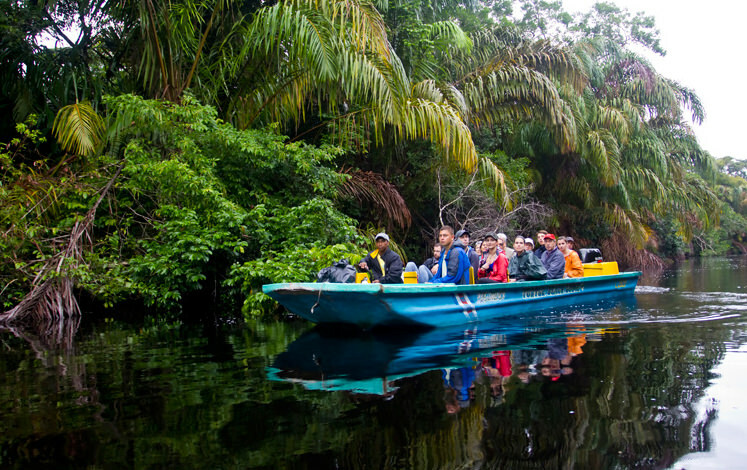 Double Occupancy: $224 per person – Tortuguero Standard Hotel. Baula Lodge. Single Occupancy: $214 USD. Tortuguero Economy Hotel. La Casona Lodge. Single Occupancy: $249 USD. Tortuguero Standard Hotel. Baula Lodge. Departure/ Return Location: San José, Puerto Viejo or Arenal with option to change destination. Departure Time: In Arenal Pick-Ups start earlier, approximately 5:20 – 5:40 a.m.
After the Canoe tour we will go back to our hotel for breakfast and check out. The afternoon is on your own. On the third day after breakfast you will have a guided hike included. This is a very different way to experience the surrounding Tropical Rainforest. And again, you can expect good information from your guide. At 12 noon we start our boat ride out back to Caño Blanco and drive out with the option to be dropped off in San José, Puerto Viejo or the Arenal Volcano. Drive from San José, Arenal or Puerto Viejo, breakfast at Exploration Center, hotel check-in. Tortuguero Village Tour, leisure time. Seasonal turtle nesting tour or night hike tour (optional). Additional $30 / from July to October only. Naturalist Canoe Tour at 5:30 am. Breakfast, breakfast, leisure time, check-out. Shuttle out leaves at 12 noon to our Exploration center for lunch and to the destination of your choice among these 3, San José, Arenal or Puerto Viejo.